Six tribes of Northwest Native Indians created their own specific artwork in the form of Totem Poles. Totem Pole Art is a traditional form of tree art encompassing wood carving and painting. Totem pole art consists of pictorial and graphic carvings that are made into trees by using sharp thin knife blades to carve into soft bark depicting symbols and figures such as animals, that represented the emblems of clans or families. The carvings are often painted. Unlike Rock Art, Totem Pole Art has a relatively short life span, lasting for about 100 years. Depending on the skill of the artist creating the Totem Pole Art, the images can remain clear or quickly become distorted and blurred during the ageing process. Ridicule Totem Pole Art, also called shame poles that were symbolic reminders of debts, quarrels, murders etc. Totem pole art is a reflection of the customs and heritage of Northwest Indians. Each specimen of Totem Pole Art tells a story. The stories tell of the animals and supernatural beings who helped found family lineages or commemorated special events in the lives of the people or the legends or the tribes and their cultural histories. The design and painting of the carvings and symbols on a Totem Pole require a knowledge of the tribal history and traditions of each tribe. The designs and carvings of Animal Totems depicted on Totem Poles had specific and traditional stylized elements. The following chart contains the styles adopted in Totem Pole Art. Totem poles were time consuming to make requiring significant manpower in their construction and erection. A Totem pole was a sign of affluence and a display of wealth. The Native American Northwest Indians belief system included Totemism and the decision to construct and raise a totem pole was subject to rituals and ceremonies. 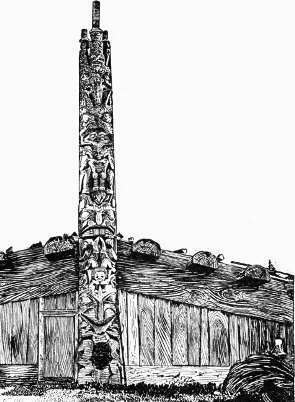 The art of designing and carving a totem pole was fast becoming a dying art until the 20th century when there was a revival of interest in native cultures and customs. New totem poles are being carved and raised in most areas where they were once common. The following link describes the process followed by Northwest Indians and How to make a totem pole.